Strawberry Shortcake is such a lovely and refreshing dessert to serve during springtime and summer. It's a real crowd pleaser, and it satisfies your sweet tooth while also incorporating a healthy serving of fruit into the indulgence. 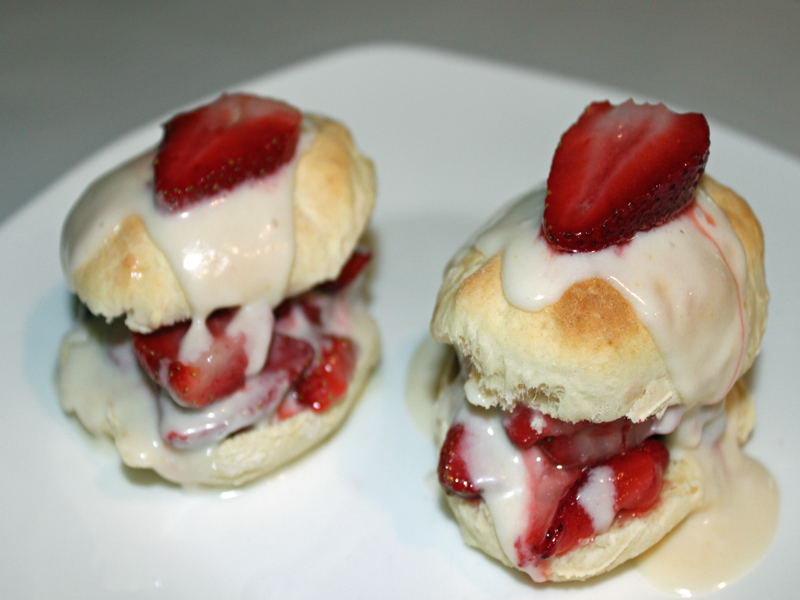 My recipe for strawberry shortcake is vegan and free of artificial colors and flavors. 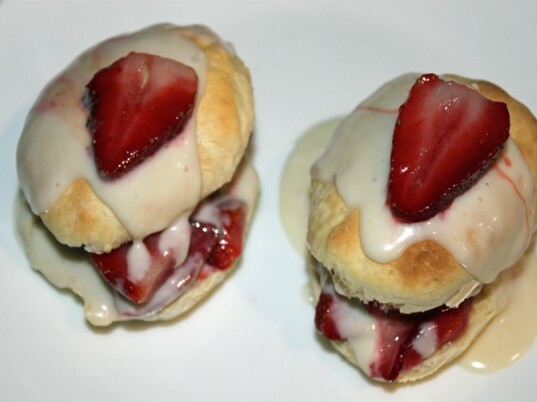 This particular Strawberry Shortcake is similar to a sweet biscuit covered with luscious strawberries and toppings! 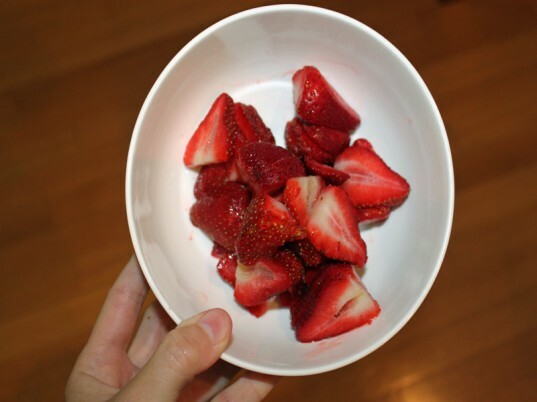 You can kick-off the fun by taking your kids to your family garden or the local organic farm to pick strawberries. 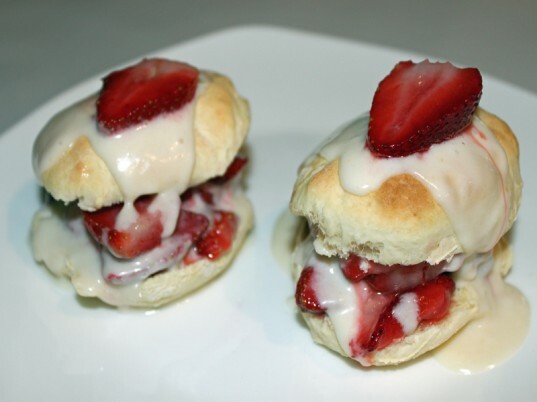 Then come home and make these yummy organic, vegan strawberry shortcakes together. Preheat the oven to 450°. Line a baking sheet with either parchment paper or a reusable silicone mat. Sift the organic flour, baking powder, sugar and salt together until they are well mixed. Then, add the vegan butter and mix until you get a crumbly texture. Add the organic vinegar to the organic soy milk and allow to sit for a couple of minutes or until the milk begins to curdle. 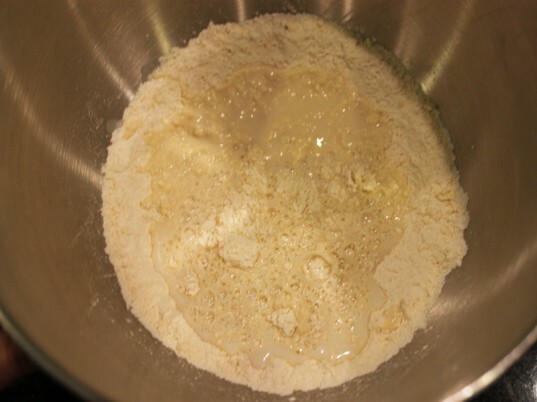 Add the curdled milk to the flour mixture and stir just until a dough ball is formed. Dump the dough ball on a well floured counter-top and knead for a couple of minutes, you can add more flour if it is too sticky to handle. Flatten the dough ball until it is about 1/4 inch thick. Use an upside down cup or cookie cutter to cut the dough into biscuits. Place the biscuits on your prepared baking sheet. You will need to knead the excess dough back into a ball and repeat the process a few times or until you are out of dough. Bake the biscuits for 10 minutes or until they are just starting to brown on the edges. Remove from the oven and allow them to cool, then slice them in half. Place a can of organic coconut milk in the refrigerator, (if you are short on time you can place it in the freezer for a few minutes). Open the can without shaking it or turning it upside down. Carefully spoon out the top layer of opaque coconut, that is what you will use to make the topping. Use a mixer to mix the coconut milk, vanilla and powdered sugar together until you get your desired consistency. Since these shortcakes are very biscuit like, I wanted a gravy type consistency for the topping — so I only mixed for a couple of minutes. Place a large drizzle of topping on the first layer (bottom) of the biscuit, cover in fresh cut strawberries, drizzle more topping. Then, place the top biscuit on, adding more topping and add a strawberry on top! Step 10: Eat and Enjoy! Preheat the oven to 450°. Line a baking sheet with either parchment paper or a reusable silicone mat. Sift the organic flour, baking powder, sugar and salt together until they are well mixed. Then, add the vegan butter and mix until you get a crumbly texture. Add the organic vinegar to the organic soy milk and allow to sit for a couple of minutes or until the milk begins to curdle. 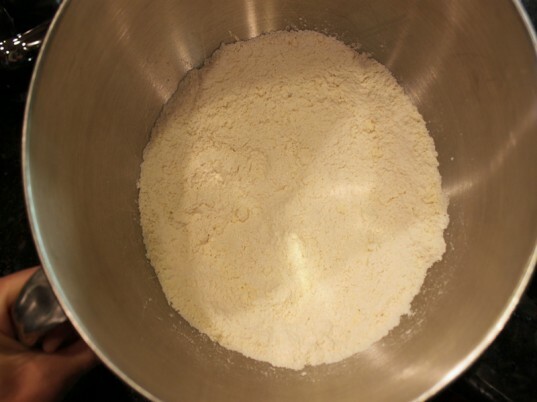 Add the curdled milk to the flour mixture and stir just until a dough ball is formed. Dump the dough ball on a well floured counter-top and knead for a couple of minutes, you can add more flour if it is too sticky to handle. Flatten the dough ball until it is about 1/4 inch thick. Use an upside down cup or cookie cutter to cut the dough into biscuits. 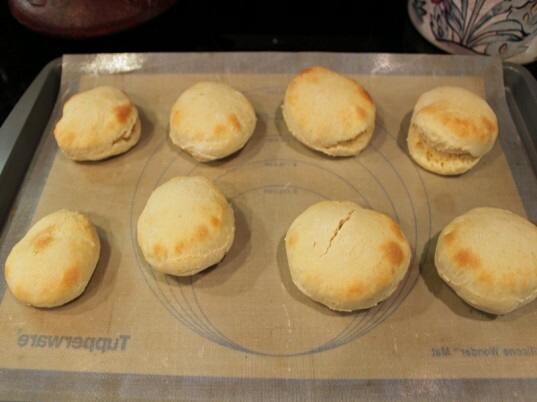 Place the biscuits on your prepared baking sheet. You will need to knead the excess dough back into a ball and repeat the process a few times or until you are out of dough. Bake the biscuits for 10 minutes or until they are just starting to brown on the edges. Remove from the oven and allow them to cool, then slice them in half. Place a can of organic coconut milk in the refrigerator, (if you are short on time you can place it in the freezer for a few minutes). Open the can without shaking it or turning it upside down. Carefully spoon out the top layer of opaque coconut, that is what you will use to make the topping. Use a mixer to mix the coconut milk, vanilla and powdered sugar together until you get your desired consistency. Since these shortcakes are very biscuit like, I wanted a gravy type consistency of the topping — so I only mixed a couple of minutes. Place a large drizzle of topping on the first layer (bottom) of the biscuit, cover in fresh cut strawberries, drizzle more topping. Then, place the top biscuit on, adding more topping and add a strawberry on top! Use an upside down cup or cookie cutter to cut the dough into biscuits. Place the biscuits on your prepared baking sheet. You will need to knead the excess dough back into a ball and repeat the process a few times or until you are out of dough. 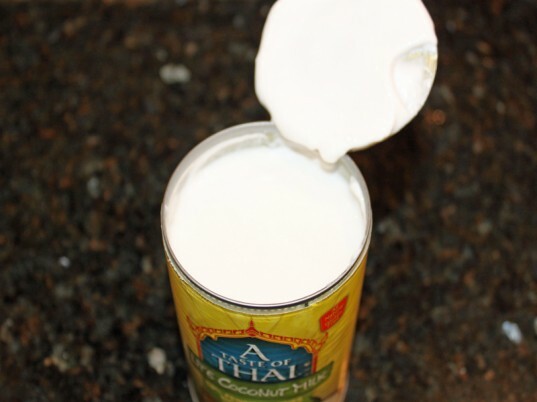 Place a can of organic coconut milk in the refrigerator, (if you are short on time you can place it in the freezer for a few minutes). Open the can without shaking it or turning it upside down. Carefully spoon out the top layer of opaque coconut, that is what you will use to make the topping. Use a mixer to mix the coconut milk, vanilla and powdered sugar together until you get your desired consistency. Since these shortcakes are very biscuit like, I wanted a gravy type consistency for the topping -- so I only mixed for a couple of minutes. 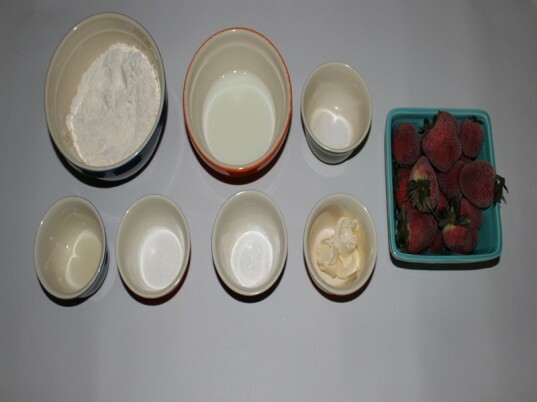 1 can organic coconut milk 2 tablespoons organic powdered sugar 1 teaspoon vanilla strawberries Preheat the oven to 450°. 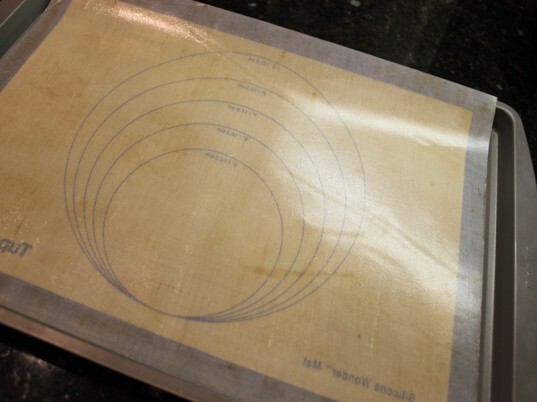 Line a baking sheet with either parchment paper or a reusable silicone mat. Sift the organic flour, baking powder, sugar and salt together until they are well mixed. Then, add the vegan butter and mix until you get a crumbly texture. Add the organic vinegar to the organic soy milk and allow to sit for a couple of minutes or until the milk begins to curdle. 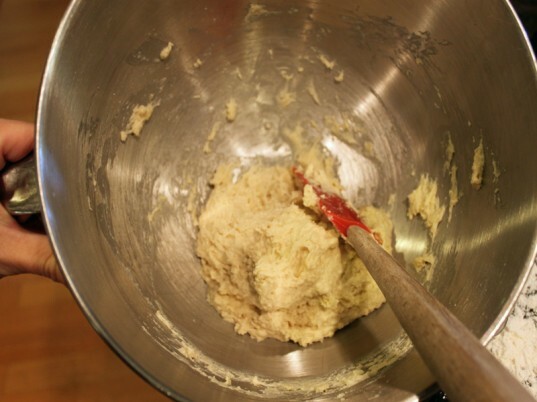 Add the curdled milk to the flour mixture and stir just until a dough ball is formed. Dump the dough ball on a well floured counter-top and knead for a couple of minutes, you can add more flour if it is too sticky to handle. 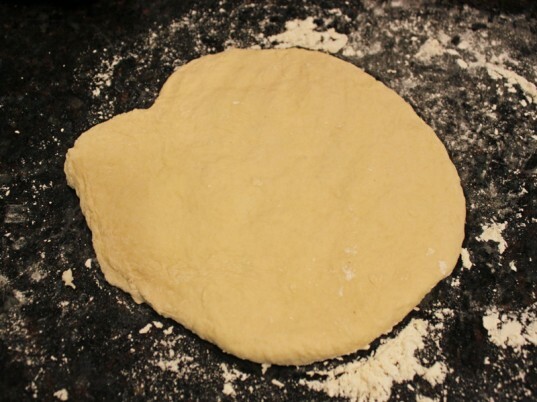 Flatten the dough ball until it is about 1/4 inch thick. Use an upside down cup or cookie cutter to cut the dough into biscuits. Place the biscuits on your prepared baking sheet. You will need to knead the excess dough back into a ball and repeat the process a few times or until you are out of dough. Bake the biscuits for 10 minutes or until they are just starting to brown on the edges. Remove from the oven and allow them to cool, then slice them in half. Place a can of organic coconut milk in the refrigerator, (if you are short on time you can place it in the freezer for a few minutes). Open the can without shaking it or turning it upside down. Carefully spoon out the top layer of opaque coconut, that is what you will use to make the topping. Use a mixer to mix the coconut milk, vanilla and powdered sugar together until you get your desired consistency. Since these shortcakes are very biscuit like, I wanted a gravy type consistency of the topping -- so I only mixed for a couple of minutes. Place a large drizzle of topping on the first layer (bottom) of the biscuit, cover in fresh cut strawberries, drizzle more topping. Then, place the top biscuit on, adding more topping and add a strawberry on top!